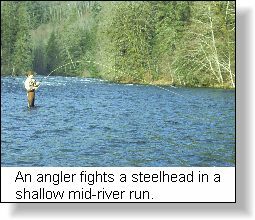 "Steelhead Fishing a New River"
When I steelhead on a new river or, walk the banks of an old friend that I haven't visited for a long while, I consider a number of factors before even casting. These elements, the critical factors for success include water color, pools and riffles; streamside canopy; size of river; dominant riverbed material; known historic fishery; access routes and hatchery introductions. In my last article I discussed the color of the water and how it affects my decisions for reading water, fly patterns, lures and casting for steelhead. In this second part I will look at some other critical factors involved in successfully fishing new streams for winter steelhead. Every stream has an unique race of winter steelhead that has evolved site specific to that river's special conditions. 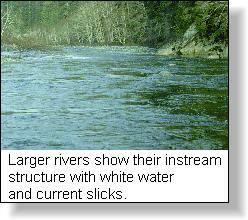 These conditions include water flow, gradient, stream length, spawning gravel, and tributary mix, just to name a few. As a result of these unique conditions, winter steelhead have evolved since the last ice age (during the last 12,000 years) to enter their home rivers at optimum times which will ensure the survival of the eggs, alevins and fry in those special river conditions. This is the 'seasonal spawning window' for the river. We can generalize for most rivers by saying that this 'window' starts early in December and concludes in April. We can even be more specific by saying, that while winter steelhead runs begin in December, rivers without a major lake at their headwater will have later runs, a longer window, which may extend well into May, and, in some cases, even into June. For the steelheader this seasonal spawning window is crucial for it can be used to determine and plan your winter angling trips. This information is now well documented for almost all B.C. rivers and is available at Provincial Fisheries offices. It is also available from experienced steelheaders - if they are willing to share what may have taken a lifetime to learn. While there is a variable seasonal spawning window for winter steelhead, every stream has historic peak runs. Often these 'run peaks' can be generalized to the months of December, February, March and April. However, my experience has shown me that not all rivers follow this general timing. In fact it appears that most rivers usually have only three 'run peaks'. These 'run peaks' are also know to fisheries. In the early part of the season, the 'peaks' are dependent upon storms hence they cannot be defined as occurring on a specific date. Rather, they will occur immediately following a seasonal storm in a two to three week time period. On the other hand, late in the season, warm rain water and snow pack melt will have fresh winter steelhead entering their river every day. Hatchery Steelhead or "Urban Steelhead"
The introduction of hatchery steelhead in specific streams has created a new dimension to the 'when' to fish those streams. These 'urban steelhead' have specific return times which are usually well known. Fisheries is your best source of information as are local sporting goods stores. 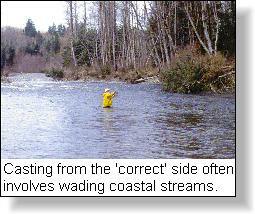 Steelhead have holding preferences in each type of stream. For streams with thick streambank vegetation, steelhead will hold in any water that gives them cover; sometimes even very shallow runs. Pools are the natural holding water but all anglers should also spend time casting in the riffle sections that look like they will hold fish. If there is a large boulder in the riffles make certain that you cast above the boulder and let your lure drift through the side slicks on either side. This is preferred steelhead holding water. For streams with open banks and extensive gravel beaches all steelheaders should concentrate on the tailout section of defined pools. As well, deep water pockets in riffle sections, usually obvious by deeper colored water, should also be fished. However, regardless of which kind of stream I am fishing I still work on the principle that 60% of steelhead will lie in the pool tailout; 20% will lie at the pool headwaters; and 20% will rest in the main pool area. Over the years, as rivers have changed their banks and locations, I have noted that tides and the amount of daylight have dictated the general location where winter steelhead will hold in streams. In fact, even when the river has created a new course I have discovered that winter steelhead will hold in locations near where they held during previous years in old riverbeds. These pools are often referred to as the 'meat holes' and they are easy to locate by the 'ornaments', (various lures) hanging on the tree branches on the far side of the pool. 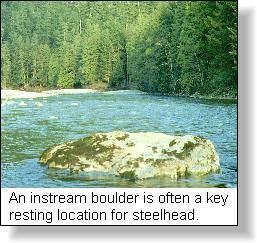 Don't ignore these pools if you are new on the river as they are certain areas where you will find steelhead. Winter steelheading is without question the closest angling we have to hunting. Most steelheaders will agree that steelhead are easy to catch once they have been located. The secret to regular success lies in learning to read river water and the clues the river gives. Success is also dependent upon doing your homework; seek out those sources with current information and capitalize on their advise.